Cabbage Soup Diet, the miracle of the cabbage soup diet is actually no miracle at all, but a great way to lose up to 15 pounds in a very short amount of time. The diet literally consists of eating cabbage soup and various other low calorie foods for one week. Some have considered this to be a miracle diet because it has helped them to lose a great deal of weight in a very short amount of time. Most say that this diet is very hard to stick to because you have to eat the same exact thing every day for a whole week. The diet works because you are filling up on water and cruciferous vegetables (broccoli, cauliflower, and cabbage). There are a few drawbacks to this diet. First, you must eat the same exact thing every day for one week. This can be mixed up a little but by adding some different seasoning to the soup, as well as eating fruit and starchy foods like brown rice and baked potato. However, you are limited as to when you can eat these other foods. Most days, you must stick to the cabbage soup. Another drawback is that the recipe is extremely bland. Most people find that they must season the soup with salt, pepper, garlic powder, chili powder, or a variety of other seasonings just to get some taste in the soup. Yet another drawback is that the recipe lacks nutrition. You are basically eating vegetables all day long which are lacking in fatty acids, protein, and calcium. Though, these can be replaced with dietary supplements. Another complaint about the diet is that it will leave you extremely gassy for the duration of the diet. We all know that cabbage makes you have gas, and eating it for a whole week€¦ One final complaint about this diet is that it takes a considerable amount of will power, but of course, so do most other diets. 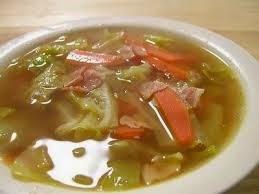 There are some great things about this cabbage soup diet. If you can get past the bland taste of the cabbage soup (some people really enjoy it) this miracle diet can actually work wonders. One of the pros to this diet is that you will definitely see results. While I cannot guarantee anything here, I have seen many people lose a bunch of weight on this diet. However, this is not a long term fix. Instead it is a diet that you should use to start another longer-term diet. The fact that you need a great deal of will power to start and complete this diet will put you in the right mind set to start and finish other diets. This diet can also be a great way to lose weight for a special event that is coming up. Simmer all of the ingredients until the vegetables are tender. I strongly encourage you to contact your doctor or a licensed dietitian before starting this diet. Even though it is effective, it's best to discuss such an extreme diet with a professional.